When a University of Minnesota senior and fellow member of the WAM Collective, eager (and hopefully not beleaguered) to graduate, questioned the group recently about the purchase of his cap and gown, I was reminded of an exhibition that the University Gallery held in 1938 on the topic of Academic Dress. “Those who were on hand to witness the traditional Cap and Gown Day procession as it wound its way through the campus, over the knoll and eventually up the steps to Northrop Auditorium, watched half puzzled and awed by the razzle dazzle and color, pomp, clicking cameras and showy corsages. “The people who wear these fine letters have honorary or high academic degrees. The color of the trimming on the hood signifies the wearer’s degree; the color of the lining tells what university he wrested it from. In May of 1938, this “yarn” of a history was displayed at the University Gallery, where close to 100 examples of robes in the U of M academic dress as well as examples from Harvard University, University of Toronto, and the University of Leeds, England were displayed. A catalogue of the exhibition (at left) described the history, rules, and regulations of academic dress. 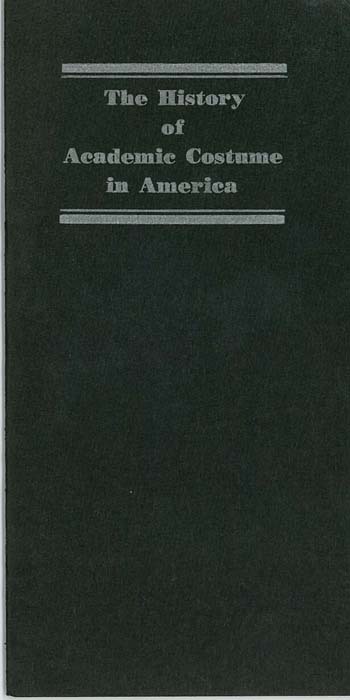 Published by Cotrell & Leonard, Albany, N.Y., and printed and distributed for the Intercollegiate Bureau of Academic Costume, “The History of Academic Costume in America” supplemented the show. While soon to be graduates in the areas of public health and pharmacy may challenge the taste and fashion of salmon pink and olive, they never-the-less will walk across the stage with outward grace as they receive the diplomas that acknowledge the dignity of their learning. Congratulations 2012 University of Minnesota graduates!